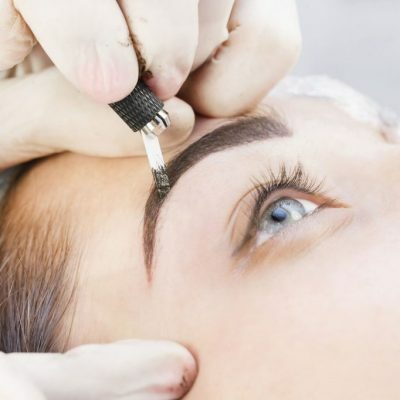 Eyebrow Micro-blading is a safe and completely controlled method of depositing cosmetic pigments into the utmost upper layer of the skin(epidermis). Also called cosmetic tattoo and micro pigmentation. Eyebrow Micro-blading helps you look your best even with a busy and active lifestyle. Eyebrow Micro-blading is the best choice to stay naturally beautiful all day and night. Microblading is a superficial solution to sparse, over-plucked, over-waxed and thinning eyebrows. It is ideal to cover scars and gaps, define the shape, create an arch and fill in the brow. Microblading allows to sturgeon natural looking eyebrows for people with very little or no brow hairs. This procedure is perfect for both men and women. The outer layer of the skin without reaching the dermis. the needle used in manual micro-blading is 3 times thinner than the one used in a machine, which allows creating very fine, crisp hair strokes that do not blur after healing. Last anywhere from 1-3 years with a touch up recommended once a year to retain shape and color saturation of pigment. Apply aftercare cream for the best results. Use a Q-tip to apply to eyebrows. Do not pick at the brow when the color starts to peel. To be a certain color is not compromised, please avoid the following for one week after treatment; sun exposure, saunas, excessive sweating, and brow make up. Swimming, increased sweating, hot sauna, hot bath, Jacuzzi, UV/UVA Rays or chemicals treatments or peelings, and/ or removal of the pigment. Any laser or chemical treatments or peelings, and /or any creams containing Retin-A or Glycolic acid on the face or neck. Picking, peeling, or scratching of the micro pigmented are in order to avoid scaring of the removal of the pigment. Drinking alcohol in excess, and it may lead to slow healing of wounds. Note that because of natural skin regeneration, after the recovery period(peeling), brows might appear lighter than original. This might give you the impression that color is fading too quickly. Often even with proper care, customer develops bald spots or loose original hair stroke which makes brows look uneven. It is absolutely normal. That’s is the reason why most customers need a touch-up after 1 month to assure that brows are perfectly even and the desired effect was achieved. Once the healing of the j skin starts taking place, it will look like dandruff flakes or dry skin. However, this is just superficial color and dry skin being naturally removed from eyebrows. The final look of your eyebrows will be apparent approximately 30 days after your procedure. Once completely healed, always apply a layer of sunscreen SPF 30 up to SPF50 on your eyebrows when exposed to the sun. Sun exposure might cause the color pigment to fade away more quickly. When using foundation, be aware when applying to avoid our healed eyebrows. if foundation covers healed brows, your eyebrows will appear lighter.